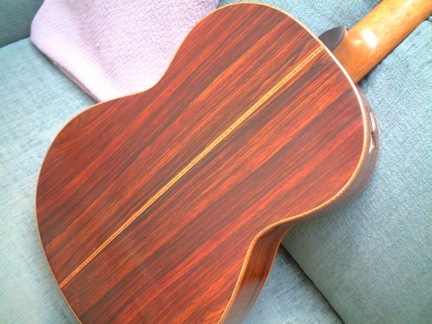 Cocobolo Rosewood to my ear stands fairly close to Brazilian in tone and is a very beautiful wood with a lot of variation in figure. It is somewhat warmer in tone than Brazilian but it can still produce brilliant guitars. It is a heavier, denser wood than Brazilian with all of its faults in terms of workability. Luthiers can develop allergies to the dust so I have to protect myself more so than with other species. The continuing supply from Latin America seems sustainable and of high quality. About 30% of my orders are for this wood.